Last week the vendor (SirsiDynix) announced that the software was upgraded and it was no longer in Beta. While it is still not perfect, it is much improved and I feel fairly comfortable encouraging users to try it, in either version. I’ve seen both the iOS and the Android. The Apple iOS is more polished looking and works better. I guess that’s to be expected; it’s been around longer. But the Android version works well for most things now. After you download it, you can select your library. It does give you a list of nearby libraries, so that makes it fairly easy to select the Dwight Foster Public Library and then access the catalog and your account (assuming you aren’t on vacation in some tropical paradise when you do this step) simply by entering your library card number and PIN. 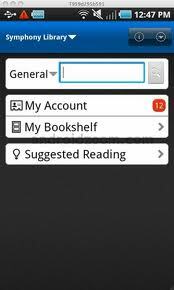 The app has some neat features, including an interface with a social site for readers called Goodreads. It also displays the number of issues that need attention (for example overdues to return or holds to pick up) by displaying a red number in the “My Account” area on the home screen. In the image above, their are 12 such items. Pretty nifty way to remember that you need to get to the library! Please let us know if you have any questions or issues. ← Want to hear about the best book I read in 2011? For some reason your comment appeared on the post about the BookMyne App. Not sure why that’s so but I’m glad you are going to read the book. It’s actually staffer (YA librarian), Melissa Rader’s favorite book not mine, but I guess I better get in line to read it! I agree with you, I love YA books. They *always* make me think.